The all-new 2012 Chevrolet Volt has entered into its second year of production remaining mostly unchanged with the exception of a few tweaks. Having been on American roads for a year now, the new Volt continues to be among the most fuel efficient cars on the market. The debate continues on whether the Volt is a verifiable hybrid, electric car or just what some of the more car-centric techie folks refer to as a plug-in hybrid electric vehicle. Either way, the Volt has embarked on a lonely road. This very road is well-traveled if you are one of the lucky owners of General Motor’s most technologically advanced vehicle yet. 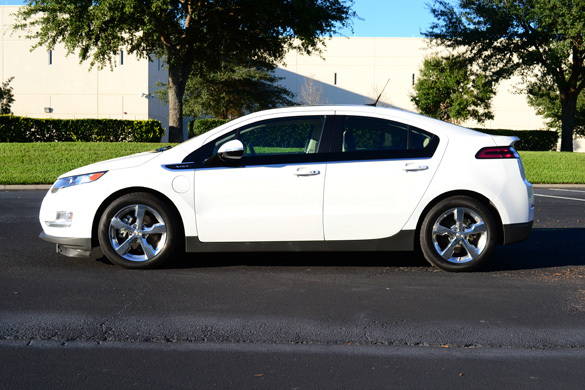 I reviewed the 2011 Chevrolet Volt earlier this year with a clear open mind spilling copious amounts of data. This year, after many breakthrough but friendly debates with other automotive journalists, I start to come to an understandable conclusion of the Volt’s long-term effectiveness and general perception from the public. The new Chevrolet Volt is a well-built 4-passenger plug-in hybrid electric vehicle in a class of its own that anyone can drive and appreciate. 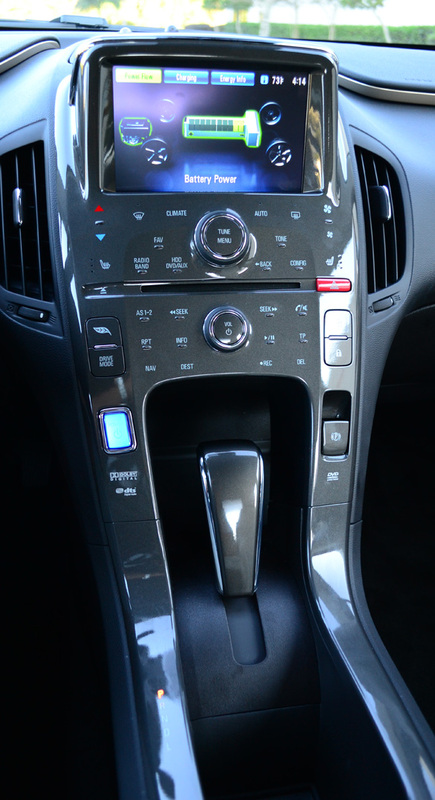 The all-new 2012 Chevrolet Volt enters into its second production year carrying over the same design but adding new standard features such as an updated keyless ignition/entry system. The new keyless entry system adds front door buttons for quick keyless unlocking and locking. Other changes include putting the previously standard (for 2011) Navigation and Bose stereo system packages on the options list. I also took note to a traction control disable button on the roof panel which could not be found on the 2011 model. If you are not all familiar with the Chevrolet Volt, then it can be easily understood if you think of it as an electric vehicle with a gas-powered generator that keeps electricity pumping when the battery becomes depleted. Although the Volt is a much more complex object, to the driver everything is simplified to the point that you can jump in and drive to any destination that a paved road will take you. In other words, if you are in within 300 miles of a gas station, then you will have no issues reaching your destination as fast as you can legally drive. On the flip side of things, the new Volt can be used solely as an electric car giving drivers a range of 25 to 50 miles on a fully charged battery without using a drop of gasoline. Once the battery power is 70% depleted, the small 1.4-liter four-cylinder gas engine kicks in as a power source for the electric motor. I found my new 2012 Volt, after depleting the usable battery range, still kicking over to battery power under low-speed conditions. Most times, such as when stopping at a stop light, the engine kicks off to save gas much like a hybrid would. 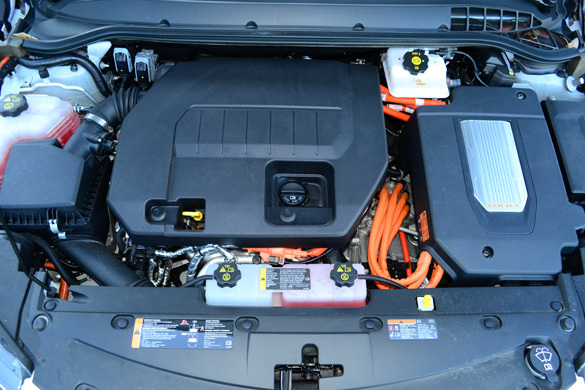 The major difference in the electric motor drivetrain in the Volt versus a hybrid is the Volt’s 111 kilowatt 149 horsepower and 273 pound-feet of torque electric motor powering the front wheels. The robust electric motor handles all of the duty of propelling the 3,781 pound vehicle. The internal-combustion gas powered engine does not provide power to the wheels except under rare high-speed conditions through planetary gear-set. 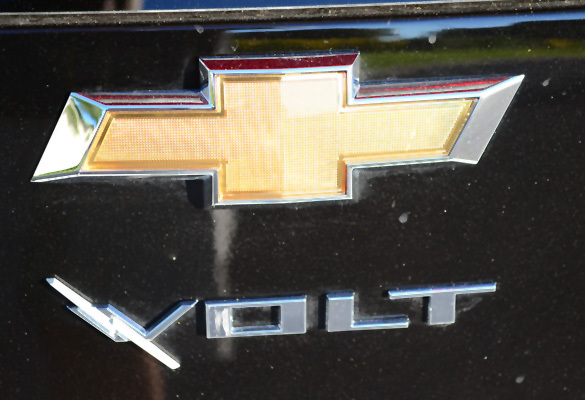 Aside from educating consumers on how the Chevrolet Volt operates, you must know that Chevrolet has created a perfect blend between a hybrid and electric car. 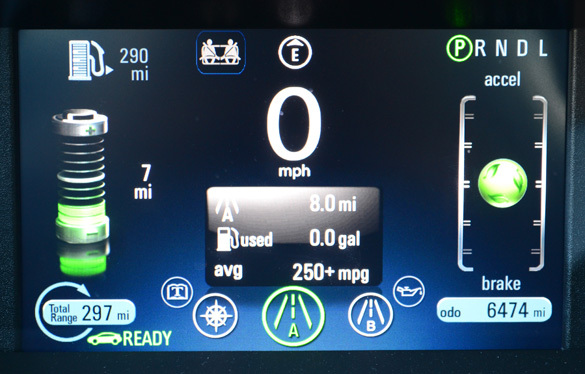 The new 2012 Chevy Volt takes the best of both worlds and masks hard-working components under sleek sheet metal and driver information displays. 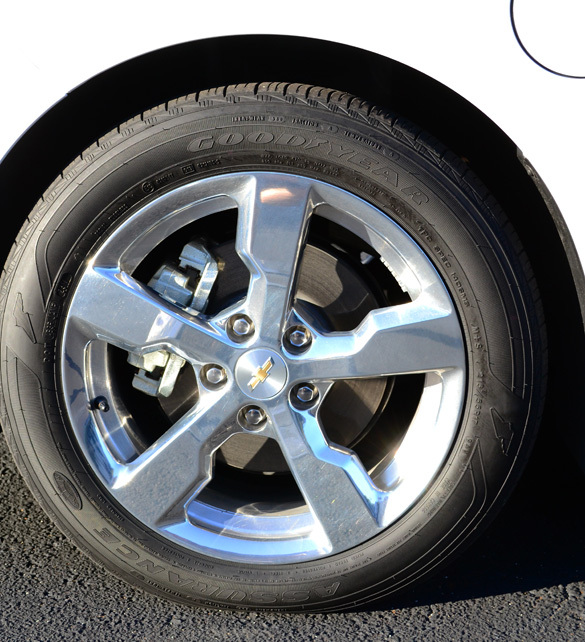 The all-new 2012 Chevrolet Volt has a relaxed ride where the suspension seems to be a bit on the soft side. Power output comes on instantly, hence the instant 273 ft-lbs. of torque available from the electric motor. 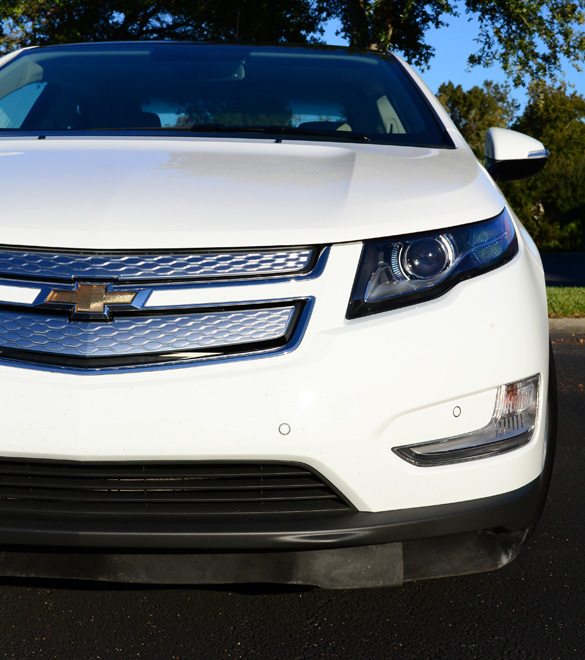 This gives the Volt an edge when power is immediately demanded. Unfortunately, with only 149 horsepower, the power seems to flatten out as you reach cruising speeds at full throttle. Of course the Volt is no drag racing machine by any means, but it could benefit from a bit more horsepower to keep that burst of power momentum going. The Volt’s handling abilities are predictable and over-all the vehicle feels somewhat balanced. Braking, off-braking and deceleration engagement feels like any other gas-powered vehicle with a torque converter and automatic transmission. 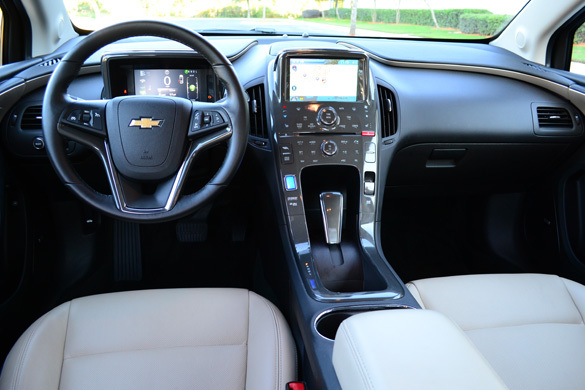 General Motors went over the Volt’s power management and control system with a fine tooth comb that it gives a driver an experience not much different from other cars. 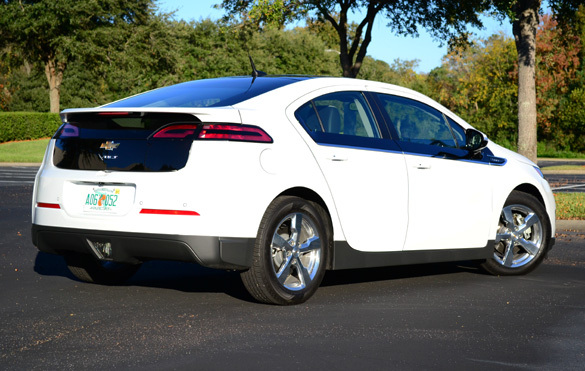 As far as any new software updates, the new 2012 Chevrolet Volt does not drive different from the previous 2011 model year. If GM made any changes in power management, they are unnoticeable. I did notice that the electric range seemed to have improved slightly where I was able to get 39 miles from a full charge versus the 2011 Volt’s test of 34 miles earlier this year with similar driving conditions. On the inside things are ultra quiet until the slight buzzing hum of the 4-cylinder engine kicks in when charging power is needed. It is a rather odd feeling when you cruise at highway speeds and the gas engine is mostly out-of-sync with the position of the gas pedal. If you ever demand acceleration power, don’t be alarmed to hear an abrupt acceleration of the gas engine attempting to recuperate used battery energy. When the new Volt is running exclusively off of battery power, things tend to get quiet to the point that pedestrians may not hear the Volt creeping up on them in a parking lot. For that reason, GM has a dedicated “horn twiddle” or what is called a pedestrian friendly alert. Essentially the alert, accessed by a button on the turn-signal stalk, softly chirps the horn as to not startle pedestrians but instead cautiously warn them of your presence. On the older 2011 Volt, the pedestrian alert was activated together with the headlight flasher instead of being a separate function found in the new 2012 model. 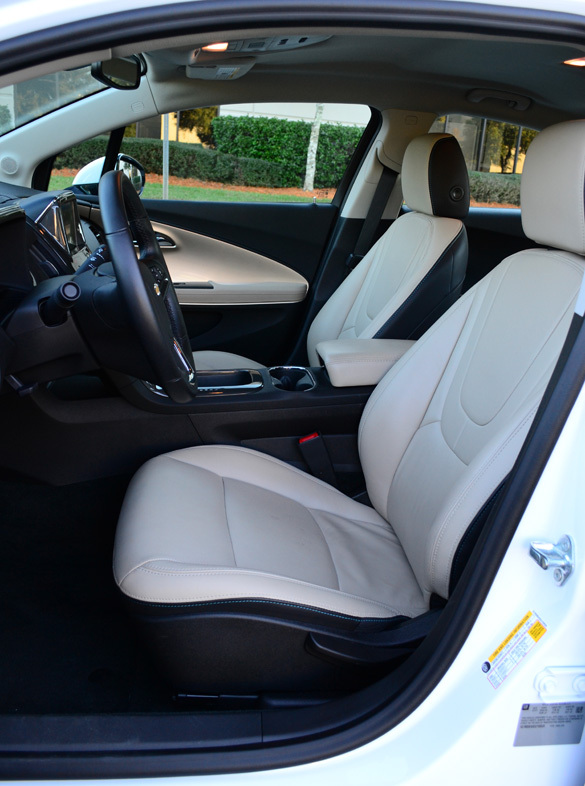 The new 2012 Chevrolet Volt’s interior remains mostly unchanged. The touch-sensitive center-stack buttons look to be larger than the 2011 model but still take a while to get used to even if you are a pro at using your iPhone or other touch device. Simply put, you will end up at some point and time mistakenly pressing buttons. The audible button feedback is a necessity as it is a confirmation of the touch-sensitive buttons being depressed. The four seating configuration is fine for 4 adults but do not expect to have left-over space to for more than 4 large bags in the rear hatch. 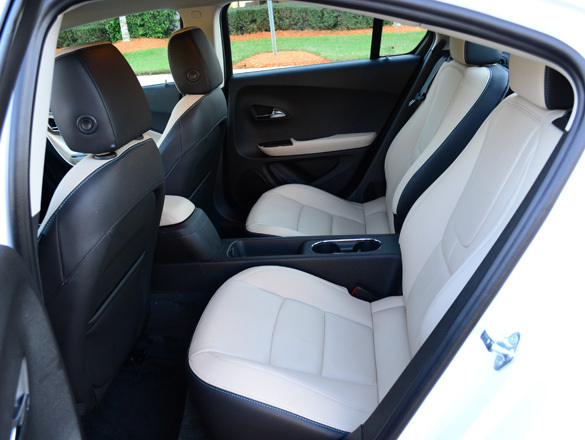 The leather bucket seats offer excellent support. 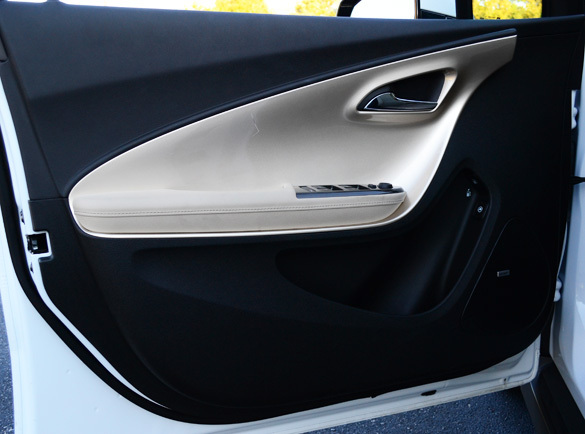 The padding for the seats is a bit on the thin side but remain to be comfy enough for a 300-plus mile trip. 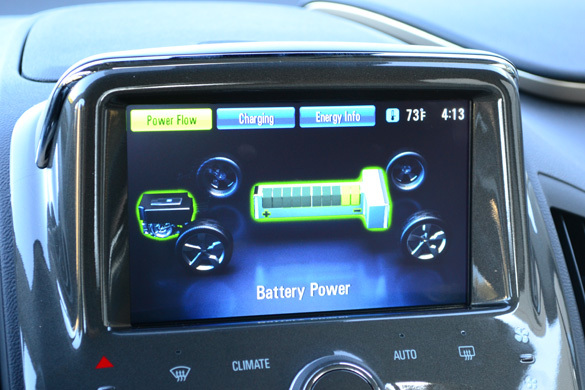 The new 2012 Chevy Volt gives the driver enough viable data to make on-the-fly driving style adjustments for the sake of conserving battery power. One can even put the A/C or heat into an ECO mode to conserve energy. 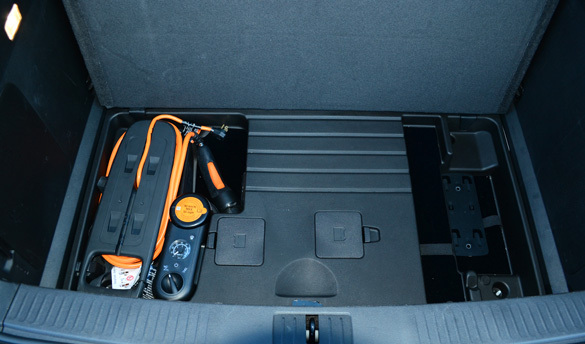 Basically all vehicle equipment runs off of the main battery’s power so every bit of energy conservation adds to your electric range provided you have charged the Volt beforehand. 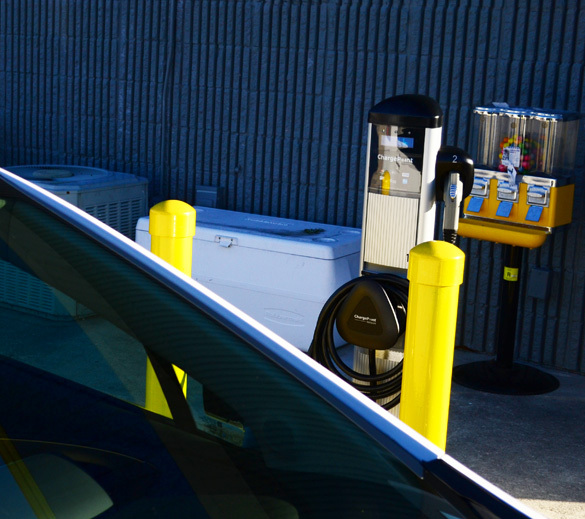 Estimated charging times can be accessed at anytime for either the supplied 120 volt portable charger cord or via an optional 240 volt station charger. Charging times for the standard 120 volt charger take about 9 hours while the optional $490 240 volt station charger takes only 4 hours. 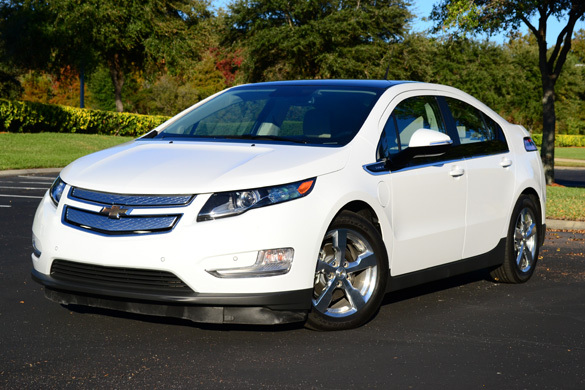 Owning a new 2012 Chevrolet Volt will put you in a league of your own in knowing that you get on average of 93 mpg. That figure is attainable if you factor in several full charges. On gas alone you will expect to get about 37 mpg, which was precisely my figure for around town gas-only driving. However, I did manage to considerably lessen my mpg figure to about 32 mpg following a several abrupt stops and starts just as an inquisitive test. Modestly priced at a base price of $39,145 you get a fairly good deal if you consider the $7,500 tax incentive for the purchase of the Volt. My test vehicle was fully loaded with Bose audio, hard-drive based Navigation, heated leather seats up front and review camera/park assist. The as-tested price of my 2012 Chevrolet Volt came in at $45,170.